Ever heard of miss mustard seed? She has a fabulous blog, is a total do it yourselfer, and has been featured in many magazines. She's pretty much my idol. 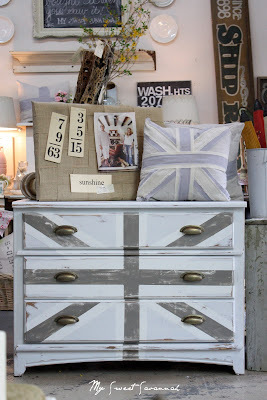 Anyhoo, she painted the most gorgeous union jack dresser. I knew when I saw it I had to copy try my hand at it. so I set out on a mission to find the perfect ugly dresser. smoothly and it wasn't over $100.00. and it was pretty plain and ugly. I sanded it down, primed it, and painted it with a base of horizon grey recommended by Maria. I then added the flag details with antique white I had matched to a pottery barn piece, and slate grey from restoration hardware. I sanded it down, quite a bit, and finished it off with antique brass bin pulls. And here she sits at ruffles and rust square waiting to go home to a new home. I think it would look darling in a child's room, but also it would look very chic in a master bedroom or family room as a side table, and it would hold a ton of storage! I LOVE it! The grey and white is so fresh and different! Nicely implemented! It looks fantastic, Melaine! I love the interpretation of the Union Jack you and Marian have achieved. Beautiful! I hope it finds a good home! Did you see this one? It was actually one of the first ones I saw done on the web. I thought it was such a great idea! And I guess Miss Mustard Seed did too! I like her version. But I really like yours with the grey too!! the white + grey is outstanding. and Agree 100% Marian is a totally a rockstar at furniture re-do's! Love love love her style! Wow, I love the colors and the design. It's great and I'm sure won't last long in your booth. This is the coolest dresser ever! An awesome idea, nicely done! It looks like something that should be in a music video... seriously. You should look into this :) Thanks for sharing this post. Have a great weekend. It is darling! You did such a great job! And so funny you mention miss mustard seed...my sister just told me about her but I have yet to check out her blog...I think I will now! That looks fabulous..great job..I will have to keep this in the back of my mind,,for when I see an ugly beat up dresser next time at the thrift store.. I LOVE IT! The grey and white is awesome. So pretty. And do I spy a woven pin board :)? Loving that as well! 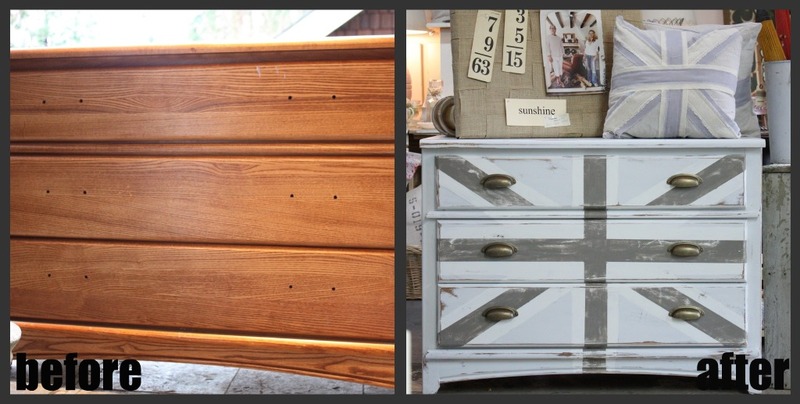 Love the Union Jack dresser in neutral colors! It is right up my alley. What a great piece! I think it will get snatched up quickly. Ok so I love Miss Mustard Seed as much as anyone, she is fabulous, but I like your union jack dresser more! I love the white and gray you did it in! It's seriously an awesome piece! I bet that dresser sells quicker than hotcakes! It's so pretty! GREAT job! I'm having a give away, a LOVELY SHABBY APPLE dress, please come over and enter! I'll keep my fingers crossed for you! This looks so awesome Melaine! Yes, I know Marion's blog, she is lovely and so creative, but so are you; your blog is really inspirational, just wanted you to know! Thanks for sharing this piece and the styling is great! A neutral Union Jack dresser. LOVE it! I always wanted to do it in my son's room but never thought of using other colors than the red, white, and blue. Perfect! I love the grays. Well done! This is such a beautiful and unique idea. Thanks for the inspiration! This is so beautiful, elegant and understated in the grey! Love it. I love your gray and white version! Love the softness of your gray and white version! 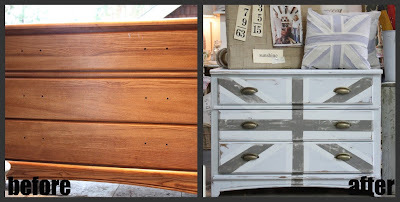 I would buy this dresser in a minute id you make and the Union Jack pillow too. Did u make that? Love all of your things and blog.